Are Tuesdays really any better than Mondays? I remember someone making the point once that if you think about the best pumpkin pie you ever ate and the worst pumpkin pie, there really wasn’t a whole lot of difference. That’s how I think of Mondays and Tuesdays. So lets get in here and kick Tuesday in the teeth and make it our day. 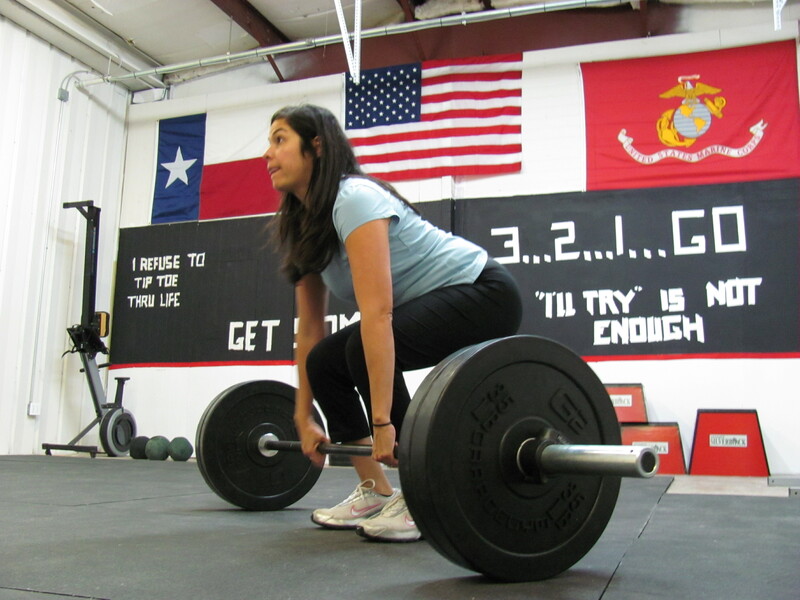 Christina focuses on a new 1 rep PR.....SHE GOT IT. Christina and my maximum deadlift 165lb. WOD -did assisted push up in place of burpee. Did 5 rounds first time, then 4 rounds for 2nd and 3rd round. Great working out with Christina and Gary. Wow, just to see Gary deadlift 305(?) lbs. Good to see Linda this morning. Always an inspiration. Great workout, Matt. I can definitely feel a difference in my deadlift from when we first started. My PR increased 100 lbs to 305. Some work on my grip, I know I can do more. Like the addition of the flags. “The Box” is shaping up nicely. Tim, you’ve done a fantastic job with the steps and the bar rack. Looks nice. See you on Thursday. Off tomorrow. I LOVE the flags!!! Looks really nice! Matt, I LOVE the flags! It looks so great- it ts so YOU!! Wow! Love the picture! Thanks for pushing me Matt. And I’ll try to erase “I can’t” from my vocabulary. Like Grandma always said “I can’t, never could do anything”. Flags look great, really spruce up the place! I still tinink I owe Gabriel a quarter after that last set. That was a HARD workout….and I don’t think it helped me to watch you do it before I had to! Though Linda would argue that it’s the INTENT that counts, LOL. I’m tired of looking at this picture…………..where is Wednesday’s post???? wow I have looked on here WAY too many times today trying to see what we have to do today!!! Anyone know?